Measuring almost two-metres tall teenager Josh Simpson looks like nothing could bring him down. But the six-foot-five Melbourne basketballer almost died mid-game six weeks ago when he suffered a cardiac arrest. Josh was running back in defence while playing for the Aberfeldie Jetts and started to feel sick before collapsing. “My vision started closing in black. So I called for a sub and I can't remember anything after that,” Josh told 9News. Mum Jodie rushed from the sidelines along with other parents and officials to start CPR. Josh was not breathing and had no pulse. “It was pretty terrifying. To see your son laying there lifeless was really hard,” Mrs Simpson said. Off-duty nurse George Fernandes was watching his son play on another court and heard the commotion. He grabbed the stadium’s public defibrillator to administer two shocks to Josh’s chest. “Then his heart started and he came back, and that was the best feeling,” George told 9News. Once Ambulance Victoria paramedics arrived Josh, miraculously, was conscious. His sudden heart failure was caused by hypertrophic cardiomyopathy – a common but potentially deadly condition affecting the ventricles. 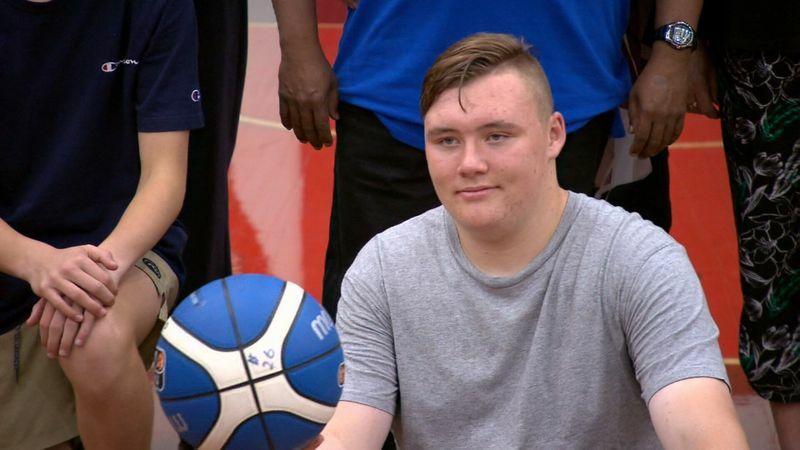 Now less than two months later, Josh is back on court to shoot a few hoops with team-mates – and to reunite with those who brought him back from the brink. “I want to say thank you to all the people who saved my life,” he said. More Victorians than ever before are surviving cardiac arrest, thanks in part of the use of public defibrillator units. State Health Minister Jenny Mikakos said a record 75 per cent of cardiac arrest patients shocked with a defib machine last financial year survived. That survival rate is up from 65 per cent in the year 2015 to 2016. “Every second counts where there is a cardiac arrest and the fact that we have got more publicly accessible defibrillators in our community now is making a huge amount of difference,” Minister Mikakos told 9News. Ambulance Victoria’s Tony Walker says 90 per cent of cardiac arrest sufferers will not make it - unless CPR or defibrillation is applied. “When people step in and do what they have done in Josh's case, and others in the community, we are seeing some of the best survival rates in the world,” Mr Walker said. Mrs Simpson is now advocating for more defibrillators on hand in case of emergency. “Every sporting hall should have them. Every school should have them. The community needs to step up. We need to do this,” she told 9News. Josh echoes his mum’s call – but is also focused on getting back to the game he loves. “What runs through my mind is 'am I going to get back to basketball, am I going to work the hard yards and get to where I need to be in basketball?'"